Compact, accurate, easy to use! This is the best rangefinder you can buy. Faster, More Accurate, Versatile Rangefinder. The Leupold GX 5i3 golf rangefinder provides faster, more accurate readings in a versatile package. This new rangefinder provides club selection recommendations based on your hitting strength, slope and current environmental conditions for a more accurate reading. This feature can be turned off to make the unit tournament legal. PinHunter 3 Laser Technology is faster and easier to use than ever while Prism Lock Technology audibly lets you know you’re locked on target. Just like any other modern rangefinder, this Leupold Rangefinder is simple to use. Push the button to turn it on, aim it, push the button again, and the distance pops up. TGR is where Leupold pulls out all the stops factoring in slope, temperature, and altitude and recommending a club based on your distances. The Leupold GX-5i3 does a great job by putting the key data – the yardage – in the center of the display. It’s also worth mentioning that the GX-5i3 has Leupold’s red display which is extremely easy to read, particularly in darker conditions. 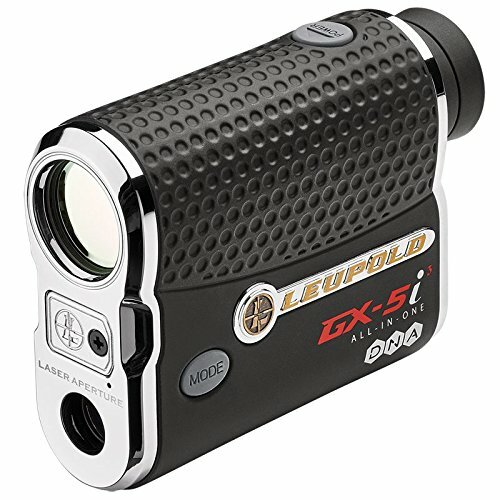 If you want to buy the most advanced laser rangefinder in golf, the Leupold GX-5i3 is it. TGR is amazing, the yardages are spot-on, and the display is perfectly laid out. The GX-5i3 does everything you can ask a rangefinder to do, and it does it well. 6X MAGNIFICATION - Utilizing Leupold's high performance DNA (Digitally eNhanced Accuracy) the 5i3 offers 6X magnification with accuracy to 1/10 of a yard!